On the information placards leading up to the monument, there’s a well-illustrated history of the area as well as a description of the wildlife of the area. This was a bonus stop, as I didn’t have Rothsay marked on the map. I had a little note at the top of my map of What's Large Where to look for the town, but I hadn’t been able to locate it in the city index – luckily, at the World’s Largest Pelican, there was a girl at the coffee shop that gave directions when she figured out what I was up to. Prairie chickens moved ahead of the settlers to inhabit the prairies of Minnesota. A large concentration of the protected bird can still be seen on prairie meadows of the Rothsay area. In the early spring the male prairie chicken performs his mating ritual called booming. He spreads his wings and tail feathers, inflates the orange wind sacs and struts while making the booming sound. 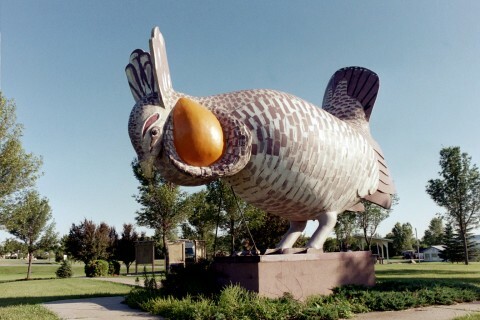 On June 10, 1975, Rothsay was designated “Prairie Chicken Capital of Minnesota”. This statue of a booming prairie chicken was designed and built by Art Fosse with assistance and funds from the community. The statue stands 13 x 18 feet and weighs 9,000 pounds. It was placed on this site and unveiled, June 15, 1976. The objective of this project is to alert area visitors and remind local residents of the beauty to be found on the native prairie grasslands.